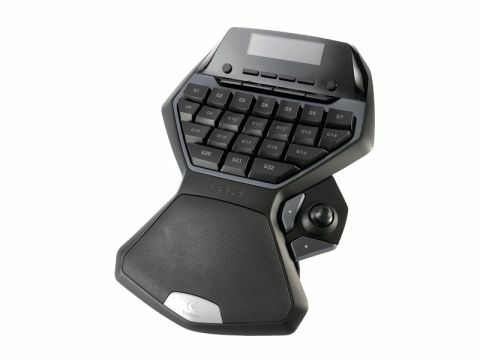 For a long time Logitech, to me, meant those fairly crappy, flimsy pieces of plastic masquerading as keyboards and mice that system integrators bundled with their PCs as an afterthought. Then someone introduced me to the G15 gaming keyboard, a wondrous device with more keys than a human had a right to expect and an LCD screen capable of displaying all the homebrew apps you can stuff into your PC. This cut-down gamepad offers as much of the G15's functionality as possible, but in a more compact and bijou form. The LCD display is there along with 24 programmable keys and a thumbstick. It comes with a load of different apps for the screen, including an RSS reader, performance monitor and media display, and with applications like LCDStudio out there you can create your own screens. As the G15's LCD display has been out in the wild for years now there's a host of applets you can pick up from existing forums that will work immediately with the G13's screen. As far as a gamepads go, it's well designed too. The hand sits comfortably on the palm rest allowing you to reach all of the programmable keys easily. In fact the only problem I have with the G13 is that it costs exactly the same amount as the full G15 keyboard. Realistically though these cut down keyboards are really only suitable for the laptop gamer who doesn't want to spend half their life in orthopaedics trying to sort out the RSI in their wrist. And for the laptop WoW-er it's ideal, but if you're strapped in to the desktop ideal you're better off with the full functionality of the G15.